Amazon India is back with a mega Diwali sale for the customers with discount of up to 80 percent on products across categories. The sale is on and will be live till November 5, 2018. 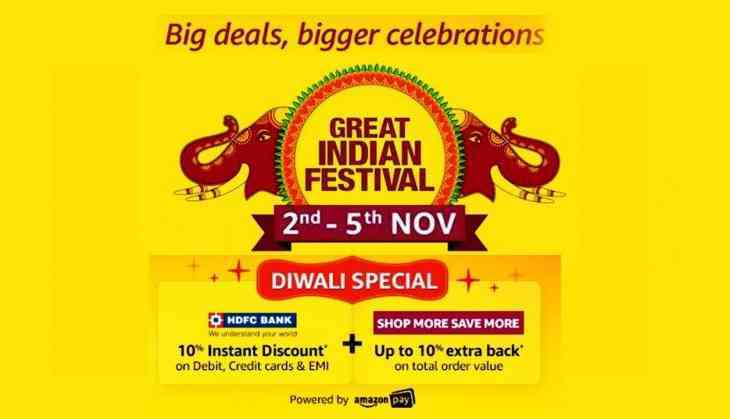 After the Great Indian Festival Sale on Dussehra, Amazon intends to attract customers with its Diwali Special Sale. The e-commerce giant have various discounts for shoppers with discount ranging from 50 percent to 80 percent on home products, up to 75% discount on kitchen and dining products, a massive discount of up to 80% on home appliance, shoes, watches, clothing, and bags. Under this offer, HDFC Bank cardholders can enjoy 10 percent additional discount of up to Rs. 1,500 on minimum order value of Rs. 2,000. The offer is applicable on debit cards, credit cards and Equated Monthly Installments (EMIs), noted the e-commerce. Amazon is also offering an exchange facility. Customers can exchange their old products for a discount on new purchases. The offer is valid on mobiles, laptops, TVs, home appliances and other appliances. First-time shoppers will enjoy free delivery. This offers is applicable on all Fulfilled by Amazon products only. Also, ICICI Bank recently launched a co-branded credit card in exclusive partnership with Amazon Pay. This card enables Amazon Prime members to earn 5 percent reward points on their purchases from Amazon. Customers who are not Amazon Prime members will get 3 percent reward points on their purchases. They will also earn 2 percent reward points on spendings at Amazon Pay partner merchants across categories such as food delivery, utility payments, movie ticketing, etc.